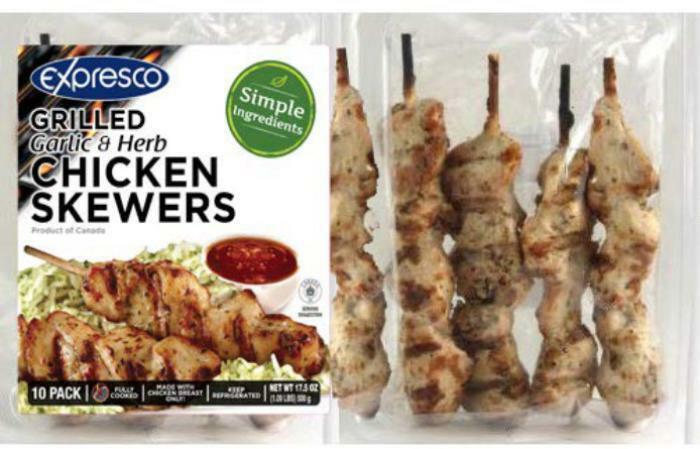 Expresco Foods of Montréal, Québec, Canada, is recalling approximately 20,446 pounds of imported chicken skewer products that may be adulterated with Listeria monocytogenes. 1.31-lb. packages of “WEST END CUISINE GRILLED MEDITERRANEAN STYLE CHICKEN SKEWERS HAND-MADE WITH CHICKEN BREAST” containing the UPC code 621588314947 with lot codes: 172562, 172640, 172571 and 172704. 1.09-lb. packages of “EXPRESCO GRILLED Garlic & Herb CHICKEN SKEWERS” containing the UPC code 621588315555 with lot codes: 172563, 172668, 172669 and 172670. The recalled products, bearing establishment number “36” inside the Canadian Food Inspection Agency mark of inspection, were shipped to retail locations in Arizona, Connecticut, Florida, Illinois, Maryland, Michigan and Texas. Consumers with questions regarding the recall may contact Garry Arpin of Expresco Foods at (514) 843-2353.